“Last year £12.2 billion** was spent on credit cards by UK travellers overseas, resulting in a staggering £335.5 million in card charges, a figure that could be even greater, depending on how many of these transactions were to withdraw cash. A slightly smaller amount of £10.4 billion** was spent abroad on debit cards – and assuming an even split between retail purchases and cash withdrawals, this would total £390.25 million in charges. In total using our cards overseas cost UK travellers a massive £725.75 million. To put this figure into perspective this could pay for over 300,000 family holidays or buy over 70 million bottles of whisky at the duty free. “So what charges can you expect to pay? 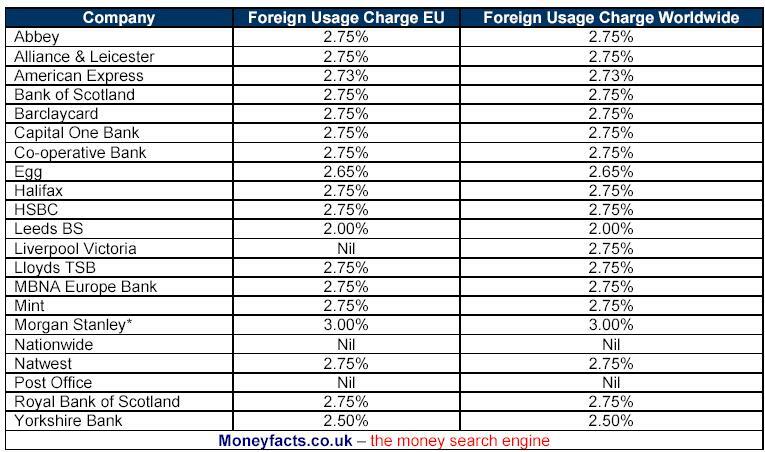 Foreign Usage Fee: Typically this will be a charge of 2.75%, this will be charged on both purchases and cash withdrawals. So for every £100 you spend an extra £2.75 will be charged. Cash withdrawal charges: These are the same as you would pay in the UK, and will be charged in addition to any foreign usage fee. There is an upfront withdrawal charge, typically around 2.5% (with a minimum charge amount), and as well as this you will be charged interest from the date of the transaction, even if you repay your next statement in full. Withdrawing cash: If you use your debit card in an ATM you may face two charges: A cash conversion charge, typically 2.75% and also cash transaction charge generally 1.5%. So for every £100 you withdraw it could cost an extra £4.25. Retail Spending: Again you could be faced with two charges for spending with your debit card in a shop. 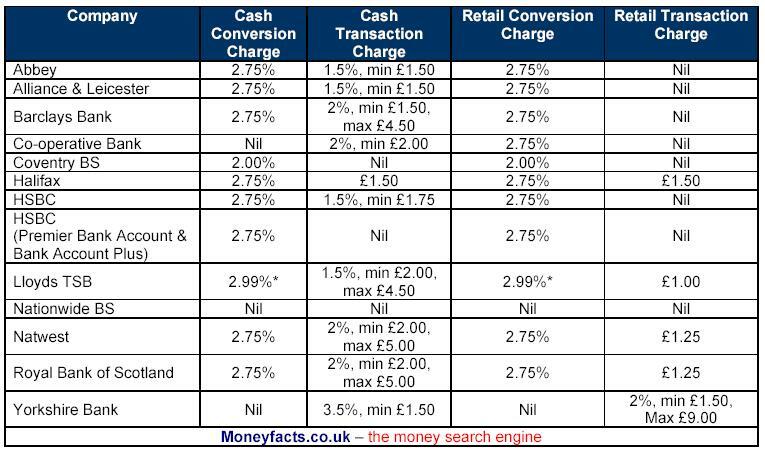 The first is a retail conversion charge, typically 2.75%, the second and less common is a retail transaction charge which can be £1.50 per transaction in some cases. “While credit and debit cards can be a convenient way to manage your holiday spending, they can also put a dent in your holiday budget if you’re not careful. The average holidaymaker spent over £10 on commission fees in 2006 – and this is without taking into account the exchange rates used for converting the transactions. ”Using your card overseas can be a simple and hassle free way to manage your money on holiday, and with Nationwide debit cards, or the Nationwide / Post office credit cards it can be cost free too. But with any other cards you need to spend wisely, watch how and when you use your cards, small and frequent withdrawals from an ATM abroad can prove far more costly as opposed to a couple of withdrawals for larger amounts. 1. Use a Nationwide debit card for any of your cash withdrawals – it’s the only debit card which will not cost you. 3. Try not to use your credit card to withdraw funds overseas, as even the ‘free’ foreign usage cards will incur a cash withdrawal charge and interest from the date of withdrawal, even if you pay your card off in full. 8. Often cash withdrawal fees will have a minimum charge, so withdrawing larger amounts less frequently is a more cost effective way to spend. * All cards excluding i24 MasterCard where there is no charge for foreign usage. However, the card does have a £275 per annum fee and require an income of £50K plus. Hi, I was sent over a new current account card from England to Australia, where I currently live. I have lost the pin number that was sent with it, what do I do now as I want to get money out or transfer the money online and cannot do this because the card has yet to be activated? Please help! Phone the bank and tell them what has happened. They will cancel your card and send you a new one. If you want to transfer money online, but don't have a card, try creating a Paypal account and linking it to your bank account. That will allow online purchases. You can also obtain cash from one of various mutual funds, such as Parents Plc, Sibling Co, or even Mother-in-law Ltd.